When the Wagner family back in 1972 started Caymus Vineyards, their little town of Rutherford in the central Napa Valley was still largely undiscovered, yet felt full of possibility. The Suisun Valley, which is a mere 40-minute drive southeast of Caymus, and separated from the Napa wine country by no more than a county line, has that very same look and feel as did Rutherford 45 years ago. It too has a maritime climate, with warm days and cool nights moderated by gentle breezes blowing in from San Francisco and San Pablo Bays. The Suisun Valley AVA is about one-and-a-half times the size of the Rutherford AVA, and it has rich soils that historically are known for growing stone fruit, yet the domaine is also ideally suited to growing certain varieties of wine grapes. The Wagner family recognized that when the rich soils of the Suisun Valley are paired with its ideal climate, it becomes a perfect match for growing some of the finest Durif grapes, a varietal that is synonymous with Petite Sirah. 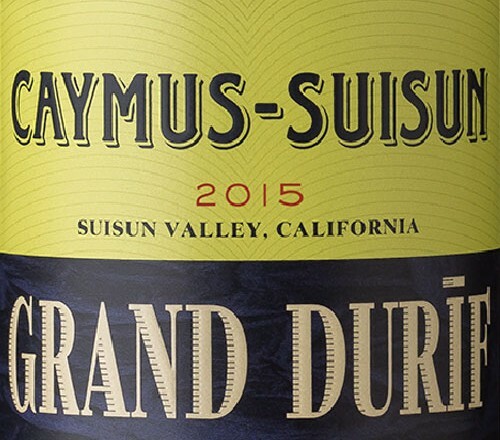 Beginning an in-depth search in early 2014 of "the Suisun", they identified a few top-quality Durif vineyards hidden in the corners of this small, picturesque valley. Setting their sights on producing a new Caymus-style wine from one of the worlds heavyweight grape varieties, they made a promise to themselves that "a new wine bearing the Caymus name would have to be great - or, it would not be bottled." With its deep color, rich texture, firm tannin, and bold flavors, there is nothing petite about Petite Sirah. The variety was originally known as Durif, but took on its more popular moniker when it was imported to California from France in 1884. Despite its origins, it has since become known as a quintessentially Californian grape. It has been commonly utilized as a blending partner for softer Zinfandel and other varieties, but has also found success as a single varietal wine. It is most commonly grown in Lodi and the Central Valley, and to an extent in Sonoma and Napa counties. Petite Sirah wines are typically deep, dark, rich, and inky, with concentrated flavors of blueberry, plum, backberry, black pepper, sweet baking spice, leather, and cigar box, and chewy, chocolatey tannins. Notes of vanilla and coconut can be found in examples with significant amounts of new oak. Petite Sirah’s full body and bold fruit make it an ideal match for barbecue, especially brisket with a slightly sweet sauce, and other rich meat dishes. The variety’s heavy tannins call for fatty protein and strong flavors that won’t get drowned out by the wine. Don’t get Petite Sirah confused with Syrah — it is not, as the name might seem to imply, a smaller version of Syrah. However, it is the offspring of Syrah (crossed with an obscure French variety called Peloursin), so the two grapes do share some characteristics despite being completely distinct varieties.